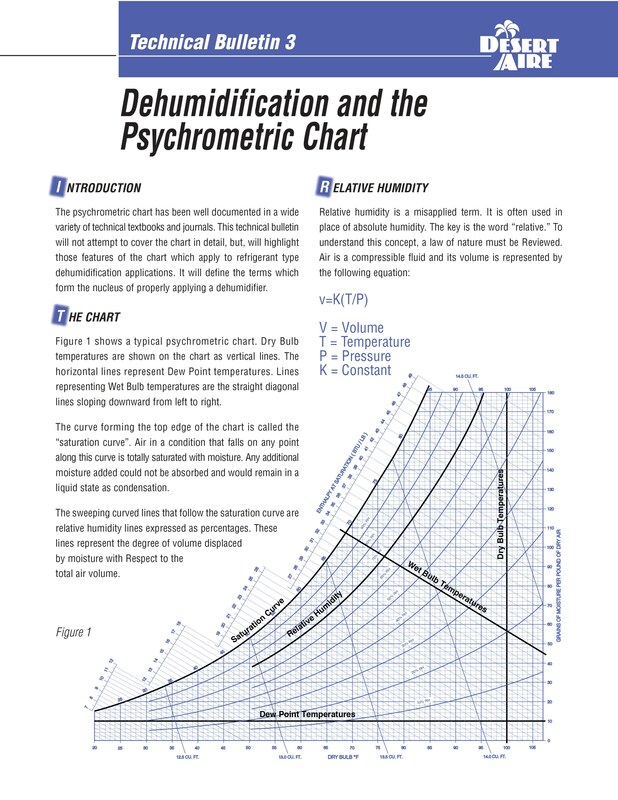 The psychrometric chart has been well documented in a wide variety of technical textbooks and journals. This technical bulletin will not attempt to cover the chart in detail, but, will highlight those features of the chart which apply to refrigerant type dehumidification applications. It will define the terms which form the nucleus of properly applying a dehumidifier. Figure 1 shows a typical psychrometric chart. Dry Bulb temperatures are shown on the chart as vertical lines. The horizontal lines represent Dew Point temperatures. Lines representing Wet Bulb temperatures are the straight diagonal lines sloping downward from left to right. The sweeping curved lines that follow the saturation curve are relative humidity lines expressed as percentages. These lines represent the degree of volume displaced by moisture with Respect to the total air volume. As the air temperature increases, its total volume increases and decreases on reduction of temperature. Pressure has the opposite effect. As pressure increases volume decreases. Water, however, is not compressible. Therefore given a specific amount, it will always occupy the same amount of volume. Figure 2 illustrates how this applies to the psychrometric chart. As moisture laden air is heated or cooled the air volume changes but the moisture does not. Thus there is a change in relative humidity, without a change in actual water content. This is important to understand because water damage occurs at an absolute humidity concentration regardless of its relative humidity. This is known as the constant Dew Point Temperature. There are four types of energy changes when heat of moisture is added or removed. Sensible heat occurs when heat is added without the addition or reduction of moisture. Sensible cooling is the reverse. Latent heat, also known as humidification, is the addition of moisture without changing the dry bulb temperature. Latent cooling or dehumidification is the removal of moisture. Figure 3 shows how these are displayed on the chart. Rarely will these occur as shown but will rather be a mixture of them. A refrigerant dehumidification system is a combination of sensible and latent cooling and sensible heating. First the system cools the air to reduce the dry bulb temperature to the dew point. Then latent cooling reduces the absolute humidity and finally the air is reheated increasing its dry bulb temperature. Figure 4 graphs this process. To properly apply a dehumidification system, the amount of moisture to be removed must be calculated. For most applications the only information available is the dry bulb and relative humidity or dry bulb and wet bulb temperatures. The psychrometric chart is used to plot these two values by finding their intersection and then following the horizontal line to the right to determine the moisture content in grains per pound. By obtaining the starting and finishing grains per pound, the amount of moisture to be removed can be calculated. The amount of moisture to be removed is the difference between these two values known as GR. Figure 5 shows how a dehumidification system was sized. The ambient design was 91°F dry bulb and 78°F wet bulb. The desired indoor value was 80°F dry bulb and 50% relative humidity. The outside ambient has a moisture content of 124 grains and the indoor design has 78 grains. Thus the required moisture removal rate is 124-78 = 46 grains per pound of dry air.